Rich, moisture-retentive soil with plenty of compost dug in before planting. Shade or partial afternoon shade. Light frost only, damaged by hard freezes. Liquid feed every two weeks throughout the season. Chives, Garlic, Nasturtium, Cauliflower, Cabbage, Tomato and Tansy. Sow indoors in early spring, and set out transplants when they are big enough to handle. 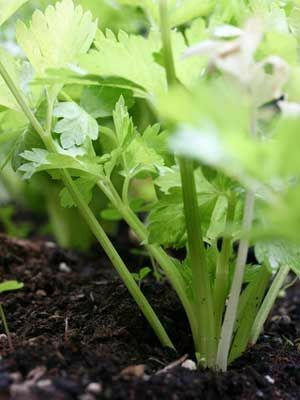 Garden-grown celery is looser and darker green than the supermarket version, with much more intense flavor. Provide water as needed to the soil moist in dry weather. Cut individual stalks as needed in the kitchen, or pull entire plants.